If it could be easily explained that the Ukraine never really owned Crimea, that the Crimea was always Russian after Russia liberated it from the Ottoman Empire, then the motives of the so-called "experts" who deliberately tried to talk America into war with Russia or indeed, did talk America into the near-war of economic-sanctions against Russia for "stealing" Crimea from the Ukraine would have to be explained. In fact, all these "experts" should be hung till dead for their treason resulting from their deliberate fraud upon this country to cause massive damage to our soldiers from a needless and unjustified war and from preventing America to trade with Russia as they push us into trading with Communist China. John McCain famously said that "Russia is an gas station masquerading as a country". Funny, he never said that of Israel's BFF Saudi Arabia, which matches the description 1000 times over. And he fights against Trump for placing absolutely needed economic sanctions on a truly evil country, China. Proof already the man is a traitor to this country. Senator John McCain: "We are all Ukrainians"
Outgoing CIA Director John Brennan blasted Donald Trump Sunday for discussing the possible easing of sanctions against Russia, saying the President-elect "does not have a full appreciation and understanding of the implications." The sanctions were especially timid, [ John] Bolton explained, since Putin had "put thousands of Russian troops across an international border" and held a "Soviet-style" referendum in Crimea, where 97 percent of voters cast ballots Sunday to return to Russian rule. On Monday, the Crimean parliament formally requested that Russia annex the breakaway peninsula. Keep in mind in this proof that the contenders for Crimea, Russia and Ukraine, are both north and west of Crimea, while Greece, Persia, the Byzantine Empire and Ottoman Empires were all to the South, while the Mongols were to the East. By referring to Wikipedia for Crimea it is easy to see Crimea's true history and to whom Crimea really belongs today should, as the entire world agrees, the only choices be between Russia and Ukraine. Rome expanded to Crimea in 63 BC. Judeo-Communists took control of Crimea when they took control of Russia in 1917 AD. The Muslim Crimean Tartars sided with Hitler during WW2, so Stalin performed an ethnic cleansing of Crimean Tartars in 1945, moving all Muslims out of Crimea to Uzbekistan. Thereafter, Crimea was mostly Russians. In 1954, Crimea as administerally moved by the Judeo-Commissars of the USSR from the RSFSR to the Ukrainian SSR. This and this alone is the entire world's claim (rather, the entire world Jewish MSM claim) that Crimea belongs to Ukraine. No vote of the Russian majority in the Crimea nor by the Russian majority in the Soviet Union was ever taken to accept this hard won conquest of the Russian Czarina Catherine the Great, to be handed over by a thieving band of Jewish Commissars to the Ukraine which never had a single son die in its conquest against the Ottoman Turks. When the Soviet Union was on the brink of collapse in 1991, and seeing the writing on the wall, there was a vote in the Crimea about where their loyalties lie - with Russia or with the Ukraine. In January 1991, the Crimea voted to restore the former Crimean Autonomous Soviet Socialist Republic, but as feared, the Soviet Union collapsed later that year on December 26, 1991. After the Ukraine declared its independence from Moscow, the Ukraine granted limited independence to the Crimea. Following the anti-Russian Ukrainian Orange Revolution of February 21, 2014, Putin said enough was enough, indicating that the Russian victory of Crimea over the Ottoman Empire should be restored. On March 15, 2014, the Ukraine tried to gain control over the Crimea by dissolving the Crimean legislature, which only allowed Putin's Russia to rightfully restored Crimea to its rightful place in Russia on March 17, 2014 when Putin took control. You can see that the people of the Ukraine never fought and bled for the Crimea. Why would a country be awarded land for no effort? Jewish commissars in 1952 Soviet Union simply moved Crimea from the Russian oblast to the Ukrainian oblast with a pen blot on a cheap piece of paper. The Ukraine has no natural rightful historical claim to the Crimea. As stated at the beginning, there is an explanation why knowledgeable American leaders such as the nefarious three Johns, Bolton, Brennen and McCain are so horribly dishonest about history and want the United States to repeal known history. The explanation is not just a mere few decades old, but plays into a much broader sense of world history and explains their behavior. We have said it many times here. The Crimea is the gateway to the Holy Lands. And everybody knows it, especially the Jews. To take the Holy Lands, you would be forced to take the capital of the last empire to dominate the area, Istanbul, formerly known as Constantinople. To take Constantinople would entail taking on the entire Muslim Middle East. Having exhausted all Muslim resistance, the Holy Lands would be ripe for the taking. 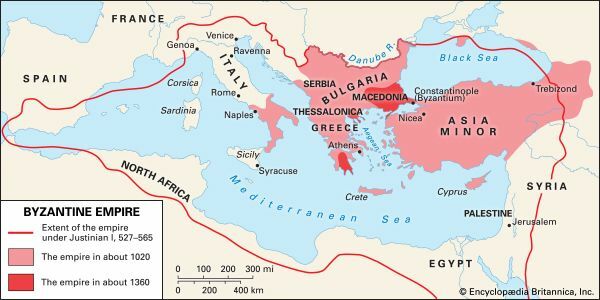 Greece and Bulgaria are the only Christian nations to the west, but they will never have the power to take Constantinople. Muslim countries are to the South and East. Possible they could take Constantinople at some far future date, but would be just another Muslim occupation, no real change. The only country with the power and the desire to take Constantinople is Russia from the North. In fact, as we've already noted, it was the desires of the Czars since the time of Catherine the Great to retake Constantinople. At the time though, she was opposed by the Christian nations of France and England. Would not be the last time this Christian protection of anti-Christian Islam against Christians would happen, as Christian Britain and Christian France saved the Ottoman Turks Muslims again, less than 100 years later in the Crimean War of 1843 AD, 400 years after Constantinople fell to the Muslims in 1453 AD. Today, it is Christian America who protects and defends Muslim Turkey from Christian Russia. America and Turkey are NATO members. Russia is not. So American Christians are by treaty obliged to protect and defend Muslims from Christians. Who is behind this massive propaganda to say Russia is the world's enemies? We knew the Jewish-led Soviet Union was indeed the world's enemies, but now that the Jewish enforced atheism of the Soviet Union is destroyed and Christianity has returned to Russia, they are still the enemy? Yes, Jews still rant and rave about the Russians. They are collectively almost as bad as my single rant and rave against them. The Chinese? No problem. Chinese spies everywhere in America? No problem. But a hint that a Russian talked to a third pier member of Trump's team? OMG!!!! !